First Lady Michelle Obama invites winners to the White House! During her speech marking the second anniversary of Let's Move! First Lady Michelle Obama announced the launch of the Let's Move Faith and Communities Communities on the Move Video Challenge and invited the winners to meet her at the White House later this year. Be sure to create and enter a video about your faith-based or community organization's efforts to reverse the trend of childhood obesity! Need further inspiration? 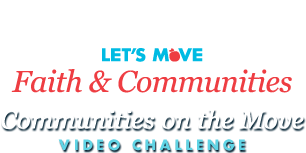 Watch the First Lady's announcement and learn more about Let's Move! Sign up for Let's Move Faith and Communities!